Soft egg noodles topped with peanut butter sauce, shredded cucumber, carrots, sesame and chili oil with a sprinkle of green onion. May be served hot or cold. Shrimp, scallops, squid, winter bamboo shoots, straw mushrooms and sugar peas sauteed in white sauce. Shrimp. celery, and peanuts sauteed in Kung Pao sauce. Shrimp, diced chicken, celery and peanuts sauteed in kung pao sauce. Prawns, bamboo shoots, straw mushrooms, baby corn, and red bell pepper sauteed in spicy tomato sauce. prawns, celery, water chestnut and wood ear sauteed in spicy garlic sauce. 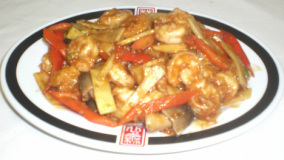 Shrimp, yellow onion, green bell pepper sauteed in black bean sauce and served on sizzling platter. Sliced prawns sauteed in excessive house special Szechuan sauce, sprinkled with sesame seeds. Shrimp, yellow onion and green bell pepper sauteed in curry sauce. Shrimp and broccoli sauteed in brown sauce. Sliced prawns, carrots, bamboo shoots and sugar peas sauteed in white sauce. Shrimp, green peas, water chestnuts and cashew nuts sauteed in white sauce. 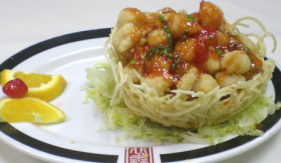 Prawns, green peas, egg, diced onion and mushrooms sauteed in excessive white sauce. .
Lightly battered crispy scallops topped wth chili sauce and delicately placed in a bird nest made of shredded fresh potato. Scallops, wood ear and water chestnuts sauteed in spicy garlic sauce. Scallops, celery, straw mushrooms and water chestnuts sauteed in black bean sauce. Scallops, carrots, bamboo shoots and sugar peas sauteed in white sauce. Scallops and broccoli sauteed in brown sauce. 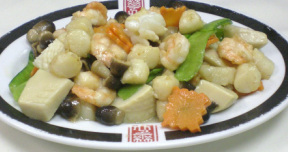 Triple enjoyment of shrimp, chicken and pork combined with baby corn, carrots, water chestnuts, black mushrooms and sugar peas stir-fried in white sauce. Chicken strips sauteed with Zechuan sauce sprinkled with sesame seed. Diced chicken, celery, peanuts and chili peppers sauteed in kung pao sauce. chicken white meat, yellow onions and green bell peppers in curry sauce. chicken withe meas, celery, mushrooms and water chesnuts sauteed in garlic sauce. diced Chicken, celery and cashews sauteed in a brown sauce. Sliced chicken, napa, sugar peas, carrots and mushrooms sauteed in white sauce. Batter fried chicken breast covered with sweet lemon sauce. Sliced chicken, sugar peas, carrots and bamboo shoots sauteed in white sauce. Sliced chicken and broccoli sauteed in brown sauce. 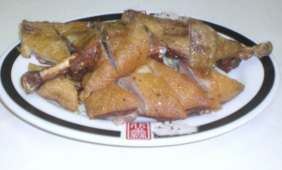 Crispy half duck served with pepper salt. 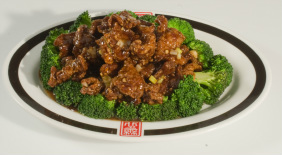 Deep fried crispy beef strips cooked in Uncle Chen's unique sauce circled with steamed broccoli. Sliced beef, orange peel and ginger sauteed in specially made brown sauce. Shredded beef, wood ear and water chestnuts sauteed in spicy garlic sauce. Fried shredded beef, yellow onion and carrots sauteed in Uncle Chen's special brown sauce. Shredded beef, bamboo shoots and peanuts sauteed with dry chili in Kung Pao sauce. 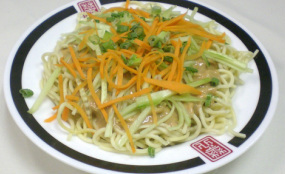 Sliced beef, carrots, yellow and green onions sauteed in brown sauce spread on a bed of fried transparent noodle. Sliced beef, sugar peas and bamboo shoots sauteed in brown sauce. Sliced beef and broccoli sauteed in brown sauce. Sliced beef, winter bamboo shoots, black mushrooms and sugar peas sauteed in brown sauce. Sliced beef, green onion, yellow onion and green bell pepper sauteed in brown sauce, served on a sizzling hot platter. Sliced pork, straw mushrooms, celery and bamboo shoots sauted in black bean sauce. Sliced pork, carrots, bamboo shoots, leek and cabbage sauteed in spicy hoisin sauce. Shredded pork celery, water chestnuts and wood ear sauteed in spiry garlic sauce. Barbecued pork, shrimp, chicken, peanuts, green peas, straw mushrooms and celery sauteed in Uncle Chen's original brown sauce. Battered and deep fried entrees with sweet and sour sauce that consists of green bell pepper, carrots, pineapple and yellow onion. Skinned eggplant, fresh jalapeno. garlic slices, pickled vegetable, and bamboo shoots sauteed in kung pao sauce. 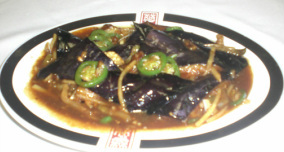 Skinless eggplant strips sauteed with spicy garlic sauce. 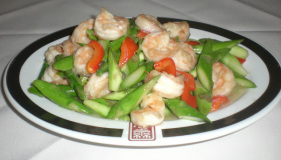 Sauteed string beans in choice of spicy Szechuan sauce, oyster sauce or plain emerald sauteed. 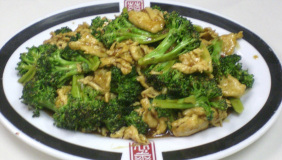 Sauteed broccoli in choice of oyster sauce or tangy sauce. Dry bean curd can be added for additional $1.00. Splendid presentation of sugar peas, carrot, baby corn, straw mushrooms, broccoli. napa, bamboo shoots, regular mushrooms, water chestnuts, sauteed in brown sauce. Fresh tofu sauteed in spicy brown sauce and sprinkled with spicy seasoning. (Add ground pork for an extra $2.00). Fresh tofu. garlic slices and jalapeno sauteed in black bean sauce. Dry bean curd, wood ear and bamboo shoots sauteed in hoisin sauce. Fresh tofu, winter bamboo shoots and black mushrooms sauteed in kung pao sauce held in a hot clay pot. Fried rice with choice of chicken or pork stir-fried with egg. Fried rice with shrimp. vegetable, and egg. 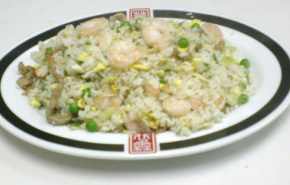 Combination fried rice with chicken, pork, shrimp, vegetable and egg. Fried rice with BBQ Pork and egg. Soft egg noodle stir-fried with plain vegetable. Soft egg noodle stir-fried with choice of chicken or pork. Shrimp sauteed with wide noodle in dark brown sauce. Soft egg noodle stir-fried with combination of chicken, pork, shrimp and vegetable. 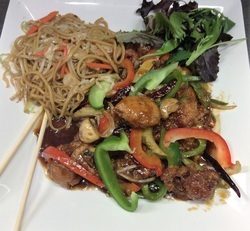 Combination of chicken, pork, shrimp and vegetable sauteed with wide noodle in dark brown sauce. Chicken, shrimp. won ton (6) and vegetable in soft egg noodle soup. Pork, shrimp, scallops, and vegetable in soft egq noodle soup.